As the Sabbath approached, Nir Etzion residents joined the thousands evacuated from their Carmel Mountain Range homes. A courteous electronic telephone menu still greets callers who dial the number of the moshav hotel in the northern community of Nir Etzion. If one choose the extension for the switchboard, a polite message asks the caller to leave a message on the voice mail. That's because the popular mehadrin certified religious hotel, located slightly south of Haifa, may no longer exist. Certainly most of the structures in the community are "badly burned," according to Israel Police spokesman Mickey Rosenfeld. The same devastation was seen in Kibbutz Beit Oren, Rosenfeld told Israel National News Friday afternoon just prior to the start of the Sabbath. However, he added, "everyone has somewhere to be for tonight, and local authorities are coordinating their care." Much of Nir Etzion, located atop Mount Carmel, went up in flames around noon Friday when the raging inferno that ignited Thursday morning on the Carmel mountain reached the small but thriving resort community. Police fought desperately with residents who had resolutely returned to their homes against the orders of security personnel after being evacuated the night before. The cooperative community was established in 1950 by the survivors of Kibbutz Kfar Etzion, which fell into the hands of Jordan during Israel's 1948 War of Independence. Nir Etzion is home to some 80 member and resident households. The community owns a large food factory which provides thousands of meals to industrial factories and companies throughout the country. It also specializes in agriculture, and has a dairy farm and a poultry coop. A similar tragic scene, involving a struggle between residents who didn't want to leave and police who insisted on taking them to safety, took place at Kibbutz Beit Oren. There, too, some residents quietly stole back into their homes after having been evacuated on Thursday. Police were equally persistent, returning to both communities and threatening to forcibly evacuate residents if necessary – and in some cases, it was. Firefighters continued Friday afternoon to also battle flames in the area between the Druze villages of Ussefiya and Daliya, as well as the entrance to Ussefiya, the Na'aman Junction, and Chai Bar. The artists' village of Ein Hod, located close to Nir Etzion, was one of the first to be consumed by the flames on Thursday. The blaze in Kiryat Tivon was brought under control sometime after 1:00 p.m., according to Public Security Minister Yitzchak Aharonovitch. In addition, the flames that threatened Tirat HaCarmel and the Haifa suburb of Denya have been brought under control as well. Eight foreign planes, three helicopters, three fire trucks and some 150 foreign firefighters had arrived in Israel by Friday noon. Due to the strong winds the blaze spread rapidly, making it necessary to evacuate some 13,000 people from their homes. 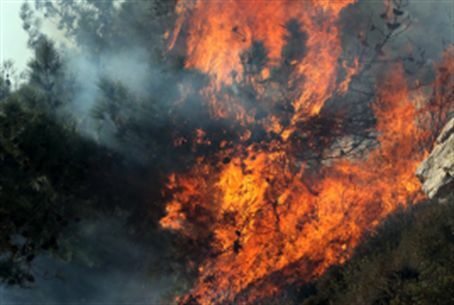 According to the Jewish National Fund, by Friday more than 20,000 dunams of forest lands had been destroyed by the fire. Routes 2 and 4 were closed locally for much of the day, effectively sealing off access to the north from the rest of the country. Route 2 was later reopened to traffic. Rosenfeld said the official death toll was 41 confirmed dead, including Israel Prison Service cadets, two police officers and a volunteer firefighter. Three others remain in critical condition at Rambam Medical Center in Haifa, including the city's Police Chief, Deputy Commander Ahuva Tomer.